iCloud usually automatically backup your iPhone data, part of people may annoyed by that because iCloud storage is limited especially when you are on free iCloud storage plan. If that is the case or you just simply need to delete stuff from iCloud, apply to the following guide to delete everything from iCloud. Part 1: How to Delete Stuff from iCloud Backup? iCloud backup like photos, notes, contacts, calendar, messages, and more can all be deleted from iCloud. Step 1: Open the Settings app in your iPhone. Step 2: Scroll down, search for iCloud and then tap on it. Step 3: Select Storage and Backup. Step 4: Tap on the Manage Storage button. Step 5: Simply select the app that you want to delete and then swipe towards the left to reveal the Delete button. Tap on it and then confirm your choice. Step 6: You can also look for the Edit button at the top right hand corner of the screen if you want to delete multiple files. When you simply delete files on your iPhone from iCloud, you might not know but many of the files are not deleted permanently. Moreover, a lot of people use the Factory Reset feature of their iPhone without aware of that factory reset is not able to permanently delete the files. Luckily, you could use iMyFone Umate Pro to permanently delete files from iCloud in a quick and simpler way. Part 2: How to Delete Stuff from iCloud Storage? Sometimes, you may need to delete stuff stored in iCloud, like your App Data, iCloud Photo Library, etc to get more free space. 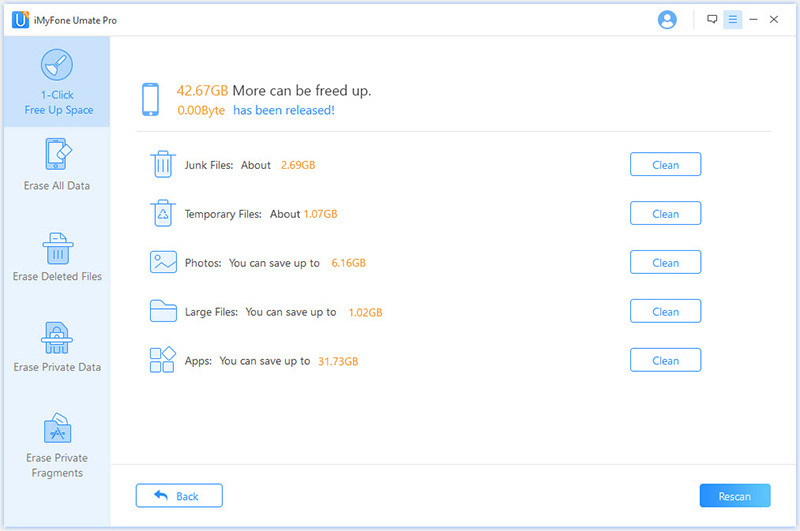 In that case, you can also apply to iMyFone Umate Pro or iMyFone Umate Pro for Mac to free up your iPhone storage. 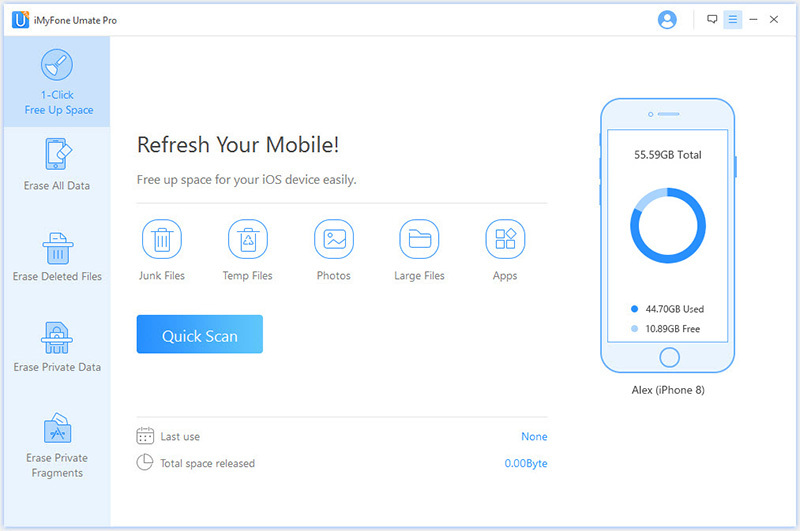 1-Click Free Up Space- Easily delete temporary files, junk files, pictures, apps, etc. Erase All Data- Delete all the data from iOS devices, including contacts, text messages, call history, photos, videos, etc. Erase Deleted File- Exclusively created to allow you to permanently delete the files that you have deleted from your iPhone. Erase Private Data- Assured that all your data, like photos, files, along with WhatsApp & WeChat data/attachment, will be permanently deleted from the device. Erase Private Fragments- Third party app fragments like Snapchat, Kik, Facebook, Instagram etc, will be wiped out permanently. Apply for the below mentioned steps to delete stuff from iCloud. 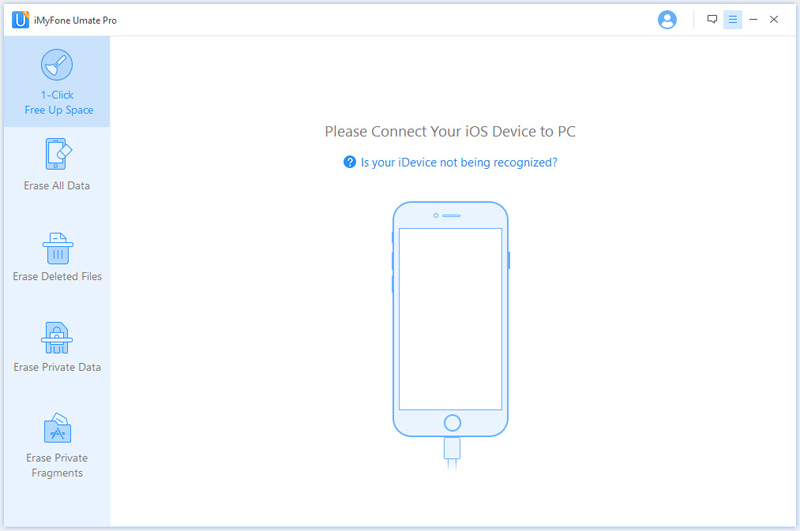 Step 2: Connect your iPhone or iPad to a laptop or PC in which the iMyFone Umate Pro software is installed. Step 3: On the screen you will find all the different types of erase modes. Apply to "1-Click Free Up Space". Step 4: Scan your iPhone. Step 5: Click "clean" after the file that you want to delete. Umate Pro is a go-to solution when it comes to managing the storage of your iOS devices in an effective, quick and simple manner. Be it removing apps that you don’t use anymore, compressing pictures without losing their quality, deleting junk files, or erasing all the data from your iOS device.